(15/P38) TRENTON – Having emerged from winter dens, black bears are entering a very active period of the year in search of food, increasing the possibility of encounters with people, especially those living in the “bear country’’ of northwestern New Jersey. “Residents can substantially reduce the risk of interactions with bears this spring by taking a few simple and commonsense precautions, starting with avoiding intentionally or unintentionally feeding bears, a situation that can create nuisance bears in neighborhoods,” said David Chanda, Director of the DEP’s Division of Fish and Wildlife. It is illegal to intentionally feed black bears in New Jersey and punishable by a fine of up to $1,000. A more common problem is unintentional bear feeding by homeowners who unknowingly make household trash, pet foods and other food sources easily available for bears to find and eat. DEP wildlife experts stress that a black bear simply passing through an area and not causing a specific problem, such as breaking into trash or otherwise trying to access food sources on peoples’ properties or posing a safety threat, should be left alone. The Division of Fish and Wildlife advises people to leave the area and allow the bear to continue on its way. When frightened, bears may seek refuge by climbing trees. Secure your trash and eliminate obvious sources of food, such as pet food on decks, easy-to-reach bird feeders, or food residues left in barbecue grills. Use certified bear-resistant garbage containers if possible. Otherwise, store all garbage in containers with tight-fitting lids and place them along the inside walls of your garage, or in the basement, a sturdy shed or other secure area. Immediately remove all uneaten food and food bowls used by pets fed outdoors. Install electric fencing as an effective way to protect crops, beehives and livestock. If you encounter a bear that is standing its ground, remain calm and do not run. Make sure the bear has an escape route. Avoid direct eye contact, back up slowly and speak with a low, assertive voice. Report bear damage, nuisance behavior or aggressive bears to the Wildlife Control Unit of the DEP’s Division of Fish and Wildlife at (908) 735-8793. During evenings and weekends, residents should call their local police department or the DEP Hotline at 877-WARN-DEP (877-927-6337). Black bears are not true hibernators and may be active all year long. During the winter, black bears enter a state of winter dormancy called torpor. While in the state of torpor their heart rate and respiratory rate slow and their body temperature slightly drops, but not as much as in true hibernators, such as chipmunks or woodchucks. Bear activity will peak in May and June as they mate. Black bears have been sighted in all 21 New Jersey counties, and bear-human encounters have occurred more frequently in recent years in places outside of traditional bear country, defined as the area west of Interstate 287 and north of Interstate 78. The DEP estimates the population in northwestern New Jersey at 3,600. 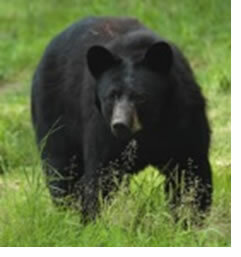 As part of an ongoing broad-based strategy to control bear-human interactions, the New Jersey Fish and Game Council, based on research by the Division of Fish and Wildlife and academic researchers, has proposed revisions to the state’s Comprehensive Black Bear Management Policy. The proposed policy will continue the six-day December firearms-only hunt in northwestern New Jersey, and expand it to areas where bears have been expanding territory. The policy also proposes a new October hunting season for muzzle-loading guns and archery starting in 2016. The DEP plans to soon advertise opportunities for the public to comment on the proposal both in writing and at a public hearing.